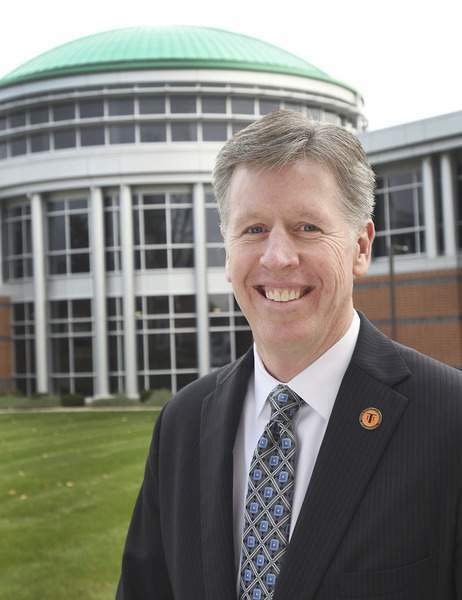 • Karl W. Einolf will be inaugurated Dec. 2 as Indiana Tech's ninth president. 9:30 a.m. – Catholic Mass, Saint Mother Theodore Guerin Chapel, 1122 S. Clinton St.
11:30 a.m. – Lunch, Indiana Tech dining hall in Andorfer Commons, 1600 E. Washington Blvd. 2 p.m. – Inauguration ceremony, Indiana Tech Schaefer Center, 1600 E. Washington Blvd. Indiana Tech will soon inaugurate its ninth president, but the occasion won't be solely about Karl Einolf. Activities leading up to the Dec. 2 ceremony focus on the community. Students, faculty, staff and alumni are expected to participate in service projects Tuesday. Participants can volunteer at two Habitat for Humanity sites. On-campus projects include making blankets, making mats out of plastic bags and creating cancer awareness ribbons. Organizers wanted to provide events on campus throughout the day so students, faculty and staff can drop in at their convenience, said Jennifer Ross, inauguration committee chair. It's coincidental – but appropriate – the volunteerism could be planned for what has become known as Giving Tuesday, Einolf said. Organizers picked the inauguration date because the board meets the day before, he said. Einolf and his wife, Maria, plan to participate in the service projects. “I've cleared the day,” he said. Inauguration week also features Indiana Tech's Distinguished Faculty Lecture at 7 p.m. Wednesday in the Snyder Academic Center theater. The topic is talent attraction and retention in the 21st century, and a panel discussion is planned. Einolf considers the inauguration as an opportunity to celebrate accomplishments and look forward to the future. The ceremony, he said, will be a “great celebration” for the college. “This isn't something we do often,” he said, adding he hopes it will be many years before the next one. Indiana Tech last celebrated an inauguration in 2003 for Arthur Snyder, who retired June 30. Einolf officially became president July 1. He came to Fort Wayne from Mount St. Mary's University in Maryland, which he joined in 1998 as a full-time faculty member. He later became dean of its business school and served as acting president from February to June 2016. Ross described him as personable and genuine. “I think students and staff are connecting very well with him,” she said. Faculty, students, community leaders and representatives from other universities are expected to attend the inauguration. Attendees should expect a formal procession, an invocation and an address by Einolf, Ross said. “From the start of planning, all of us here have worked to make this a celebration of community, and an opportunity for students, faculty and staff, alumni and the public to give back to those in need,” she said.